In my previous post on the Nitro APIs for NetScaler I shared some PowerShell examples for interacting with a NetScaler using the Nitro C# API SDK in PowerShell. I wanted to share some similar tips and samples for scripting with the Command Center APIs, which has quite a few more gotchas than the NetScaler APIs (in my opinion :). Once logged in the class heirarchy is very similar to the NetScaler APIs. Let’s look at a couple of examples of what you can do from here with some code snips along the way. The primary reason that I wanted to write a script against Command Center was to run batches of tasks against a list of NetScalers and variables. In the script I took two such csv lists as parameters loop on each to execute the tasks sequentially against each NetScaler in the list.In this example I’ll show you how to run a custom task and passing values to populate the task’s ‘UserInput’ variables. $task.annotation = "Nitro automated task executed from $($env:COMPUTERNAME)"
Write-Host "$($cctask.task_name) failed at '$failedcmd', the error was '$failedmsg'"
I hope this example was useful and that you enjoyed a second Nitro boost for your Citrix scripting repertoire! This sounds like what happens if ccapi.xml is missing from $HOME; can you run a ‘dir $HOME ccapi.xml’ to confirm? Good afternoon, I was attempting to use your example to run a command center task that kicks off a “show vrid” for a list of netscalers. When I try to execute method on the task, it tells me that the SSH credentials are missing, but I cannot find where I would set those in your example or by browsing in visual studio… would you happen to know how I set those? they are required fields in command center, but on the task I don’t see a way to set them. 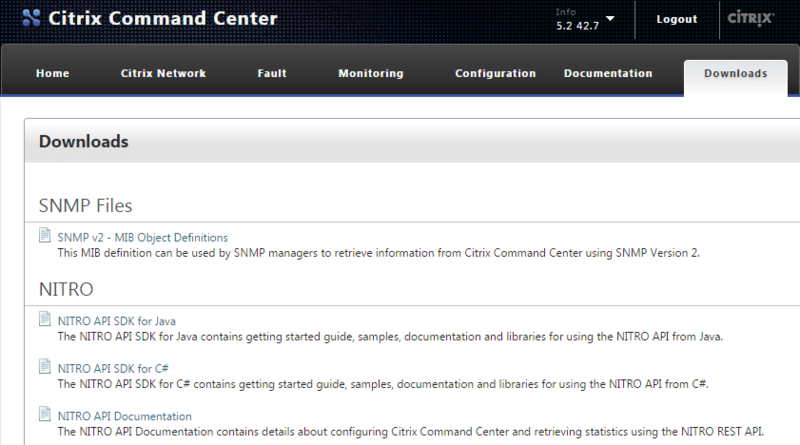 The SSH credentials are defined in the Device Profile (under Citrix Network), which is then bound to the NetScalers in the Device Inventory. 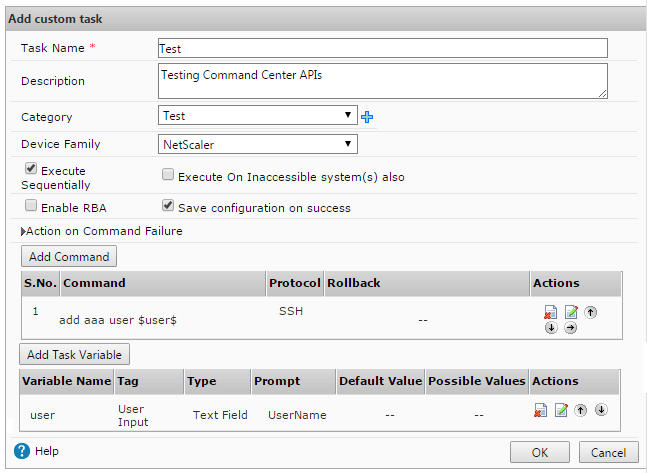 Did you already assign a device profile to the NetScalers that you’re running the custom task against? Ah, in that case you’d likely need to create and bind a new device profile before executing the task; as far as I know the Device Profile is the only way to provide credentials for custom tasks. One last question… is there a way to bind a profile to the netscaler via the NITRO API, or do I have to do it inside command center and then just call the task? I don’t see anything off the top of my head, but I’m fairly new to the NITRO piece. As far as assigning the profile to a device, I’m not too sure at first glance, as I’ve yet to find a way to get devices from the inventory using the API, let alone assign a device profile. That said, if anyone reading knows, please share; otherwise I’ll do the same if/when I figure it out.